Citation: Ference T, Fertig RM, Feldman M, Jacobs J, Casella G, et al. (2017) Rehabilitation of a Patient with Proteus Syndrome: Case Report and iterature Review. J Clin Med Ther. 2:16. Proteus Syndrome (PS) is a rare genetic disease that causes asymmetric, disproportionate overgrowth of tissues, particularly bone. PS is caused by a de novo somatic mutation in the AKT1 gene . This single mutation in AKT1, c.49G→A, p.Glu17Lys, causes constitutive activation of the AKT1 protein which underlies the tissue overgrowth and tumor susceptibility in patients with PS . The de novo somatic mutation in AKT1 is responsible for the variety of phenotypic features seen in PS . PS is a rare condition with an estimated prevalence of less than 1 case per million. PS is characterized by the presence of disorganized bone, including hyper-proliferation of osteoid causing abnormal bony structure, which results in joint deformity and can result in disability . Overgrowth and distortion of bone occurs in infancy. Manifestations of PS are not typically seen at birth but develop rapidly in childhood beginning between 6 and 18 months of age, and frequently include vertebral anomalies such as scoliosis and kyphoscoliosis [3-5]. Other frequent findings in patients with PS include macrodactyly, asymmetric limb overgrowth, limb length discrepancy and hindfoot malformation . The tissue overgrowth in PS is commonly asymmetrical, and can be bilateral . In addition, in the lower limbs, PS generally involves only one bone, while involvement in the feet will commonly affect some of the digits, but rarely all of the digits . Furthermore, patients can also have bigger bones with a normal form . The disorder causes extensive suffering and functional impairment . Although skeletal deformities are the predominate manifestation of PS, the disease can affect any tissues from all of the germinal layers . Commonly involved tissues include connective tissue, the skin, and the central nervous system. In addition to skeletal defects, PS is characterized by vascular malformations, pulmonary abnormalities, and epidermal nevi with acanthosis and hyperkeratosis . The presence of cerebriform connective tissue nevus composed of collagenized connective tissue is a common finding and, when present, is generally pathognomonic for PS. Nevi are most frequently identified on the foot plantar surfaces. The patient is a 23 year-old female with proteus syndrome. The patient has stable kyphoscoliosis (left curve with 39 degrees with apex at T6 and a right curve with 63 degrees with apex at L3). She has significant impairment regarding ambulation due to the large girth of both legs (left more than right) as well as significant leg length discrepancy (left leg is 9 cm longer than the right). Furthermore, she has abnormally formed bilateral feet. Her lower extremities exhibit pronounced weakness, and she is weaker on her left side. In addition, she has ankle weakness of both ankles with plantar and dorsiflexion of the ankles. There are no abnormalities of her upper extremities. However, she does endorse pain in the upper extremities. She denies abnormal sensation, and denies back pain and leg pain. The patient walks short distances with a walker, and her gait is unbalanced. Long distance locomotion is performed with a manual wheelchair but is limited by pain in the upper extremities along with fatigue. Our main challenge for this patient was fitting her in a wheelchair due to her large lower limbs which are problematic. We constructed a custom seat for her wheelchair along with foot plates to fit her limbs. We were unable to place AFO's due to the very large size of the limbs. Custom made shoes with a heel lift were provided to the patient to accommodate her very large and deformed feet and to compensate for the leg length problem. She was evaluated for a power wheelchair to improve her long distance mobility. Her kyphoscoliosis is currently being evaluated by an orthopedic spine surgeon. We report a female patient with Proteus Syndrome who has gait impairment causing ambulation problems due to resultant scoliosis, asymmetric limb growth, and deformed feet. This rare syndrome presents quite an extreme challenge to the rehabilitation physician. The orthopedic manifestations of PS due to the distortion of bony architecture cause significant functional issues. As a result, there is an imperative role for physical medicine physician evaluation and intervention . An assessment of the patient’s functional limitations by the physical medicine physician is needed when considering treatment options . PS patients benefit from assistive devices and specialized adaptive equipment. Non-surgical options should be considered, which include devices such as shoe lifts, to improve function in patients . In addition, patients with PS frequently require surgical intervention to minimize orthopedic deformities and to maintain function (Figure 1) . 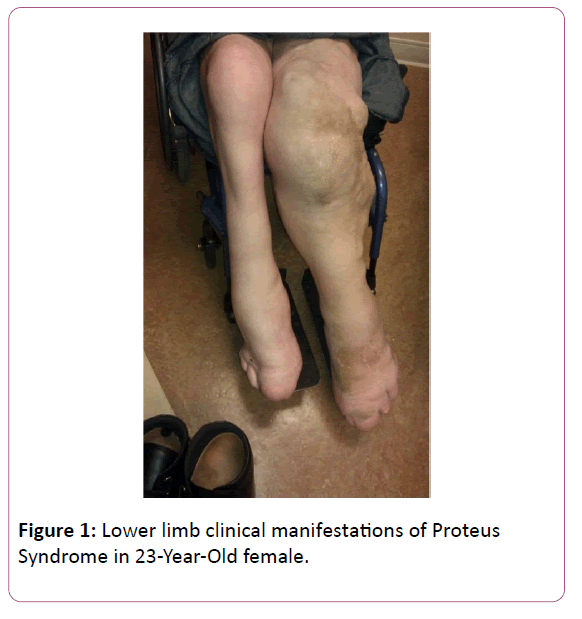 Figure 1: Lower limb clinical manifestations of Proteus Syndrome in 23-Year-Old female. A functional limitation assessment of the patient was performed which included her kyphoscoliosis, the leg length difference, the bilateral foot drop, and deformities of both feet, as well as an analysis of the patient’s functional deficits which included an unbalanced gait with very limited endurance, allowed us the ability to construct a rehabilitative plan to significantly improved her mobility for short and long distances. This case report shows the need for a comprehensive rehabilitative plan to address the multitude of issues and challenges presented by this disease (Figure 2). 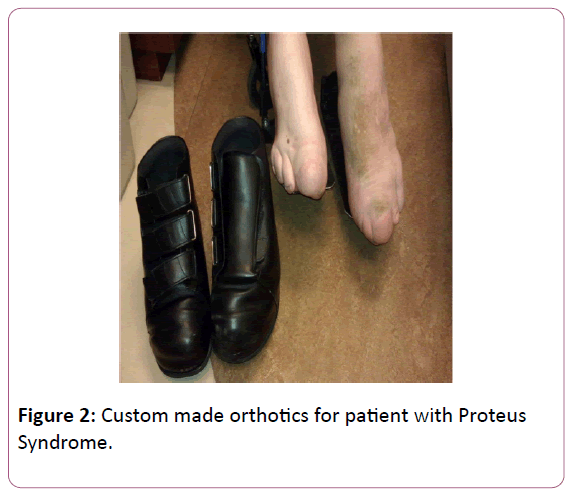 Figure 2: Custom made orthotics for patient with Proteus Syndrome. Lindhurst MJ, Sapp JC, Teer JK, Johnston JJ, Finn EM, et al. (2011) A mosaic activating mutation in AKT1 associated with the Proteus syndrome. N Engl J Med 365: 611-619. Biesecker L (2006) The challenges of Proteus syndrome: diagnosis and management. Eur J Hum Genet 14: 1151-1157. Jamis-Dow CA, Turner J, Biesecker LG, Choyke PL (2004) Radiologic manifestations of Proteus syndrome. Radiographics 24: 1051-1068. Tosi LL, Sapp JC, Allen ES, O’Keefe RJ, Biesecker LG (2011) Assessment and management of the orthopedic and other complications of Proteus syndrome. J Child Orthop 11: 319-327. Michael CM, Cohen MM (2014) Proteus syndrome review: molecular, clinical, and pathologic features nothing to declare. Clin Genet 85: 111-119. EL-Sobky TA, Elsayed SM, EL Mikkawy DME (2015) Orthopaedic manifestations of Proteus syndrome in a child with literature update. Bone Rep 3: 104-108.